a building used for the administration of local government. an event at which a politician or public official answers questions from members of the public. This is the meaning that would pop up on Google when you type “town hall meaning”. Reading the meaning of the coupling, it gives a great sense of democracy of a system. Apart from the literal meaning of democracy, it can be harmlessly said that it is synonymous to transparency. In a system, ‘transparency’ is a part of the functioning and is very important for the smooth running of that system. Not more than a year and a half back, Systematix started a great trend of bringing everyone on one platform to facilitate more ‘transparency’ to the system thus making it more democratic, by organizing- Town Hall Meeting, popularly known as the THM. 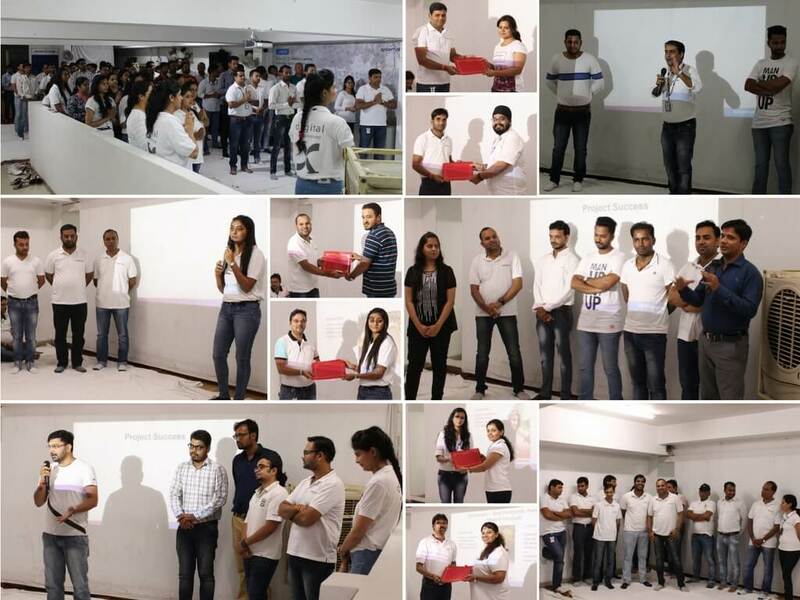 THM at Systematix is not only about a dialogue between the team and the leadership but is also a platform to motivate the recognized talent and also thank them for their contribution. The basement of the H.O. started filling up from 6:30 PM onward. People with white-clad t-shirts beaming with excitement added to the ‘whiteness’ of the space (the outspread white daris had brightened the ambiance up). In no time the basement was full of people from across verticals, offices, and geographies. At 7, the THM began with what could be called as the anthem of the event- Itni Shakti Hame Dena Deta. Moving one step further in customer service, Systematix has created an altogether new division- Customer Delight Division, which would be headed by Pradeep Jaiswal and with this great note the THM unveiled. Recognitions started with Project Success delivered by several teams working across verticals. VepROsPer (OPECO)– Opeco is an automated report developed for VE Commercials. It analyses huge revenue and financial data by executing compound calculations and drawing product comparison charts, estimating product earnings and generating financial statements. Members on the project– Jayant Soni, Kamlesh Joshi, Abhilab Das, Ankit Rawat, Mohammad Poolwala & Gaurav Joshi. Tango BMS– It is a business management system, custom made for a client who manufactures garments- The Tango Group International, UK. It eases the complex ordering and invoicing processes involved with garment production. Members on the project– Ravi Soni, Kratika Dholi, Hitesh Gupta, Dheeraj Solanki, Rupsingh Chouhan & Suraj Gautam. Special thanks to Sachin Shrivastav & Kapil Chhabra for a smooth project management and an incredible UI (User Interface). eRegister– e-Register is a multifunctional electronic attendance management system which got successfully live last week at Saint Francis Xavier College, Clapham, London. Members on the project- Ajay Rathore & Shreyans Khandelwal. Members on the project– Krishnakant Batham, Rajesh Barfa, Akash Gupta, Vikrant Mahajan & Kamlesh Kushwaha. Special thanks to Sachin Shrivastav. Mr. Main Street– Mr. Main Street is a CMS module which went live in July 2017. This application helps small businesses to meet their capital requirements by applying to the lenders for debt. It facilitates them to compare interest rates and to pick the best option suited for their requirement. Members on the project– Kapil Chhabra, Aashish Soni, Amrita Mandwale, Rupsingh Chouhan, Vrandesh Sharma & Dheeraj Solanki. The Project Success was followed by felicitating our CMO Mr. Ashish Mahajan for his Overseas visit to Spain. Nothing could be more exciting and be accomplishing than an Onsite Opportunity. One of our comrades Dilip Namdeo went to Dubai last quarter for MOF. Achievement– Priya Tiwari congratulated for topping World Venture. Pranav Rawal & Vikas Singh for receiving the Certificate of Appreciation for mentoring the event- Smart India Hackathon 2017. Gajal Khandelwal Certified Associate Business Analyst by QAI (Quality Assurance Institute). Graduate Engineer Trainees in Bhopal team were fully trained in a short span of time of 1 month with a new training approach and by engaging them on live projects. All this was accomplished under the aegis of Nidhi Bhargav. Systematix started with a new development center in Gurgaon. Systematix is a Microsoft Gold Partner now. Sounded the bugle for a newly taken initiative- The Systematix Newsletter which would be fortnightly published covering all that happened at Systematix. A special thanks were given to Deepesh Rawat, Rahul Yadav, Yogesh Sharma and Gaurav Panchal for conducting another great season of Systematix Cricket League. Lastly, the Q&A session ensued which is the essence of the THM. The leaders and mentors answered a wide variety of queries of the team which brought a lot of insight to both the sides. This brainstorming enables us to strive for a coherent working environment at Systematix. The fourth THM was more than what was expected. With multiple recognitions, recent certifications, new expansions and an hour-long Q&A session it rationalized the very spirit of the Town Hall Meeting.